Where There's A Meal, There's a Way - A look at something "scrumptious, simple and secretly healthy". A look at something "scrumptious, simple and secretly healthy". As you know by now, I made it to the top 10 of Rachael Ray's Great American Cookbook Compition, but fell just short of getting to fly to NYC to compete on the Rachael Ray show and win a bunch of prizes (drat!). However, Lauren Kudlawiec made it all the way to 2nd place (you go girl). Her recipes are scrumptious, simple and secretly healthy (I'm all about the secretly healthy). In all her recipes she gives you the overall cost of all the ingredients and calculates the nutritional information for her dishes (that takes some serious math skills right there)! Here is Lauren K's recipe for Buffalo Chicken Dip with Whole Wheat Pita Chips that she served to Lori Greiner (from Shark Tank) on the Rachael Ray show. Be sure to check out the rest of her website too! So even if you didn't get a cookbook deal with Rachael Ray, where there's a meal, there's a way! For the whole wheat pita chips, preheat the oven to 400 degrees. Lay the pita chips in an even layer on a baking sheet. Brush the chips lightly with 1 ½ teaspoons of olive oil. Season with salt and pepper. Flip the chips and repeat on the second side. Bake the chips in the over for 6-8 minutes, flipping the chips half way through baking. Transfer to a serving bowl while you make the buffalo chicken dip. For the dip, heat the remaining 1 tablespoon of olive oil in a large skillet over medium heat. Add the onions, celery and garlic and sauté until the vegetables are soft. Add the chicken breast to the pan and season with salt and pepper. If using raw chicken, cook until the chicken is just cooked through, about 5 minutes. Add the butter to the pan and melt into the chicken mixture. Stir to cover the chicken and vegetables in butter. Sprinkle flour over the entire mixture and stir to coat. Cook for 1 minute. Stir in the chicken stock and hot sauce until the mixture begins to thicken and simmer. Add the cottage cheese and cream cheese. Heat the mixture until there are no visible bits of cream cheese remaining and the mixture is simmering. You can use the back of your spoon to smooth out the cream cheese chunks to help them melt. Remove from heat. Serve hot with pita chips and raw veggies immediately or transfer to a crock pot for party-style serving! *Price and nutrition includes the remainder of the head of celery used for the recipe cut up for dipping. 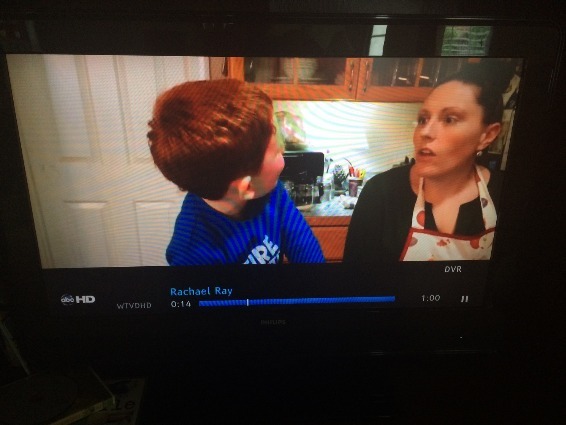 Well, me and Tucker made a montage on the Rachael Ray show about the Great American Cookbook Competiton (I like to consider it my consolation prize). But hey, Tucker made his national TV debut at age 3, pretty cool (even if it was only for .5 seconds).